NASA’s Space Launch System (SLS) has completed a major milestone with the first major piece of the rocket’s core stage being fully assembled and ready for integration into other hardware in advance of the vehicle’s first test flight—Exploration Mission-1. The forward skirt is just a small part of the 212-foot (65-meter) core stage, but it’s an important SLS component. It serves a couple roles, one being to house many of the flight computers, and it also connects the upper part of the rocket to the core stage. “Completion of the core stage forward skirt is a major step in NASA’s progress to the launch pad,” said Deborah Bagdigian in a NASA press release. Bagdigian serves as the lead manager for the forward skirt at the space agency’s Marshall Space Flight Center located in Huntsville, Alabama. 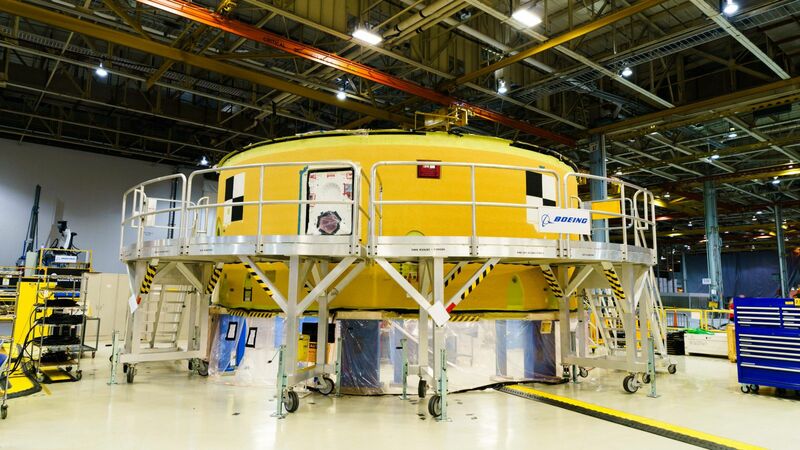 Final assembly of the forward skirt was completed on July 24, 2018, at NASA’s Michoud Assembly Facility in New Orleans. Engineers with the US space agency then conducted tests on the assembly, which required the flight computers that will control the rocket’s navigation and communications during ascent to be brought to life for the very first time. Testing of the skirt and avionics resulted in all of the hardware performing nominally to this point. The team will next move on to the installation of avionics systems in the intertank and engine section of the massive launch vehicle’s core stage. According to NASA, the intertank’s installation will be more complex than the skirt’s. The engine section will be even more complicated as it will need to control hydraulics and hardware that actually control the four RS-25 rocket engines that will power the core stage. Exploration Mission-1, the first flight of the SLS and the second flight for the Orion spacecraft, is expected to take an uncrewed Orion spacecraft on a trip to the Moon no earlier than 2020 where it will orbit for more than a week before returning to Earth. Oh, I see that little ring part(5) is the forward skirt. Not much to show for 10 years effort — perhaps they could call it a miniskirt instead. So much effort for a one shot vehicle. I’m not getting political, but with surge of reusables. It seems huge waste money, given the cost. In the meantime, the development of the BFR (Big Falcon Rocket) really resembles the spirit and enthusiasm of the early 60s, leading to the giant leap of Apollo. NASA could support that huge effort, at least indirectly, by pre-ordering some BFR flights for the mid-20s, while cancelling all work on SLS upgrades planned for after EM-1. SLS is the most powerful machine in human history. Space X is earth orbit. SLS is part of the exploration of the moon, mars, and the rest of solar system. SLS is an incomplete collection of parts scattered about various warehouses engaged in no actions of exploration. SpaceX has already left orbit. The BFR has the financial genes of a 150 ton payload reusable LEO space bomber/fast response launcher system. SpaceX has been getting government money for Fast Response/Prompt Global Strike launch capabilities from almost since it began. Hundreds or thousands of BFR flights to haul endless amounts of energy weak and low Isp chemical rocket propellant up through the fragile Ozone Layer, and destroy some of it each time, while adding endless amounts of CO2 to our atmosphere in order to build colonies on Mars is not an environmentally, economically, and politically sustainable plan. High Isp propellants and other resources mined on the Moon and used though-out Cislunar Space would have far less negative environmental effects on the Home Planet. America’s SLS launching various large and reusable space tugs and upper stages that have efficient solar electric or nuclear thermal space propulsion systems will offer cost effective high Isp transportation systems to help explore and mine the resources and high Isp propellants available on the Moon, asteroids, and Mars. Prompt Launch on Need fast crew rescue capability in LEO and across all of CisLunar Space is one of many important possible uses for the SLS and International Orion to help reduce some of the high risks of human LEO and Cislunar missions. Full launcher reusability adds mass and reduces by about 50% a launcher’s LEO payload when compared to a similar but non-reusable launcher. That mass inefficiency of a fully reusable launcher equals about twice the direct damage to the Ozone Layer when compared to a similar but lower mass non-reusable launcher doing the same mission. If Congress wants full SLS reusability, that option should be quite doable.